Hall of the Mountain King: Review: Crazy Lixx, "Riot Avenue"
Review: Crazy Lixx, "Riot Avenue"
Maybe it’s a longing for simpler, better times, but I’ve found myself listening to a lot of 1980s-influenced hard rock lately, both comebacks from bands of the era and newer acts that play the style. Perhaps no one I’ve heard nails it better than Sweden’s Crazy Lixx. Riot Avenue is the band’s third release, but it’s my introduction, and I may have to go back and check out their previous albums. 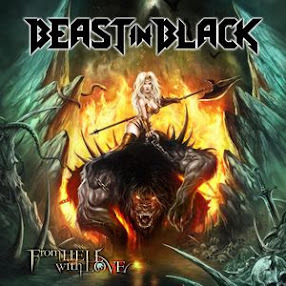 What we’ve got on this record is a very faithful reproduction of the better aspects of the glitzy 1980s hard-rock scene. The songs here are all catchy numbers with great guitar riffs, tight harmonies and big hooks. Had it been released 25 years ago, no doubt it would have been a huge record. This is a band that sounds like it actually belongs to the era rather than a group of guys who were probably toddlers during the heyday of the scene. The not-so-secret weapon of Crazy Lixx is vocalist Danny Rexon. In his vocals, you’ll hear shades of Paul Stanley, Joe Elliott and a few of the other best known voices of the era. The unmasked Kiss influence is undeniable throughout. Many of the tracks, “Fire it Up,” in particular, would have been right at home on one of that band’s 1980s efforts. The best track on the album, though, we don’t get until toward the end. “Sweet, Bad and Beautiful” starts out with a sleazy guitar strut and a cool vocal delivery from Rexon and builds to a fantastic chorus hook. While lyrics like “You’re a dirty dancer, I’m your stripper pole, you rock my body and shake my soul” aren’t likely to get Rexon recognized as one of the great lyrical poets of our time, it’s perfect for the dirty groove of the tune. There’s a lot of Def Leppard, a little Kiss and, yes, even a little Winger. I can guarantee, though, there’s not a child of the ’80s out there that can hear this song once and not have it repeating in their head all day. “Church of Rock” is another great example of hitting the stride of the style perfectly. It’s got a tough guitar riff and another one of those monster, memorable choruses that the band seems so good at. The title track is another high-energy rocker that shows off some nice gang vocal harmonies. Seeing a pattern here? The guitars of Andy Zata Dawson and Edd Liam are crisp and tight throughout the record, and the overall sound manages, to my ears, to capture the spirit of a 25-year-old genre, yet sound pretty fresh at the same time. I’m also quite pleased by the dearth of ballads. There’s only one on the record, the album closer “Only the Dead Know,” and it’s much more in the vein of Skid Row’s “Quicksand Jesus.” It’s a dark sort of melancholy song, and yes, Rexon does channel Sebastian Bach’s quieter voice in places. It’s a knack he has, for making you think of other singers in places without ever actually sounding like them. 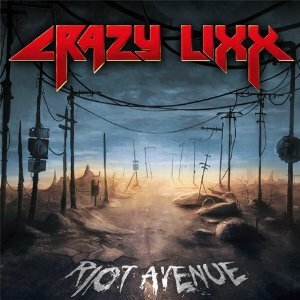 Like most purveyors of this style, Crazy Lixx leaves you shaking your head here and there on Riot Avenue. I wondered, for example, why they decided to go to the trouble of naming a track “Whiskey Tango Foxtrot” when they just shout out what they really mean in the chorus. Seems to defeat the purpose of trying to be clever with the title. But, let’s face it, this kind of music is not for thinking. It’s for partying, and Crazy Lixx deliver the good times on just about every track. For us former big hair hard rockers, Riot Avenue is as good as a time machine. Review: Aerosmith, "Music from Another Dimension"